HA-19, a Ko-hyoteki ("Type A Target") class midget submarine, was built at Kure Naval Shipyard in 1938. For the Pearl Harbor attack, she was piloted and commanded by Ensign Kazuo Sakamaki (November 8, 1918 - November 29, 1999) and her other crewman was Petty Officer Second Class (or Chief Warrant Officer) Kiyoshi Inagaki (1915 - December 8, 1941). 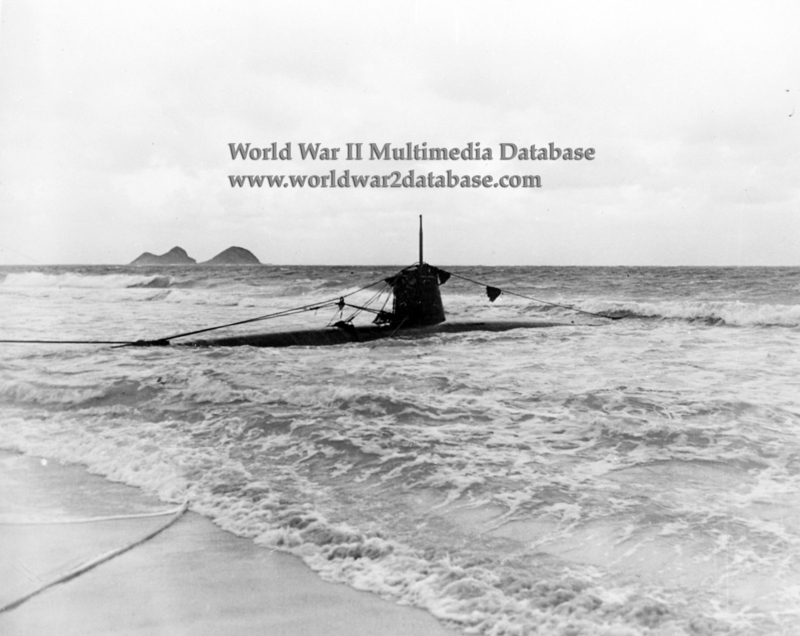 HA-19 is shown in this view after grounding off Waimanalo. Seaweed hangs from the cable strung from bow to stern to cut defense netting. She was discovered by reconnaissance aircraft of the 89th Observation Squadron. A patrol captured Sakamaki, who became Japanese Prisoner of War Number One. Sakamaki was alone until the Battle of Midway in June 1942, when survivors of IJN Hiryu were captured after being adrift at sea. HA-19, her torpedoes removed, traveled around the United States on War Bond Drives.